Flight Lieutenant Pete Brothers is greeted by his bull terrier “Merlin” on returning to RAF Biggin Hill. He is being questioned by the intelligence officer about the intense air battle that has just taken place high over Southern England. The ground crew are diligently working to prepare the Hurricanes of 32 Squadron for the next sortie, which will take place later that day. Pete's 1928 Bentley sits at dispersal with a sign in the windscreen Air Defence Priority which Wing Commander Crossley Officer Commanding 32 Squadron had all the pilots display in their cars so they would not be held up in road blocks that surrounded Biggin Hill, should the urgent call come through to get to the Airfield immediately to scramble. The local defence were informed of their priority and were waved through. 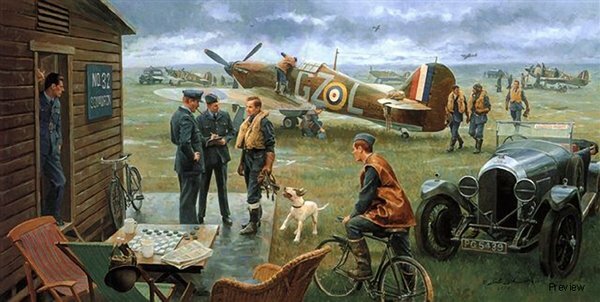 Return to the Bump/Biggin Hill, Summer 1940: is a limited edition of 500 Fine Art prints beautifully reproduced from an original oil painting by the noted award-winning artist Gil Cohen. Wing Commander Jack Rose CMG MBE DFC.